Above - The Northampton New Theatre during the run of 'Submarine F7' - Courtesy Alan Ashton, former projectionist at the Savoy Cinema. 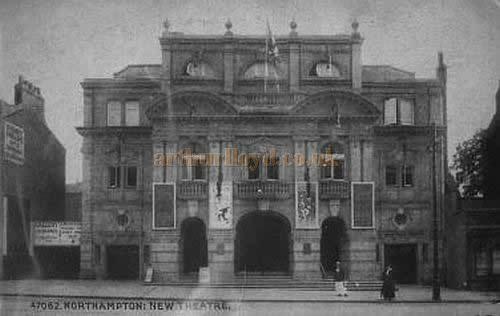 The New Theatre in Abington Street, Northampton was designed by the respected Theatre Architect W. G. R Sprague and first opened as the Hippodrome Theatre on Monday the 9th of December 1912, the same night coincidently as the Theatre Royal, Guilford. The name of the Theatre was variously known over the years as the Hippodrome, the New Theatre and Hippodrome, and later just the New Theatre. 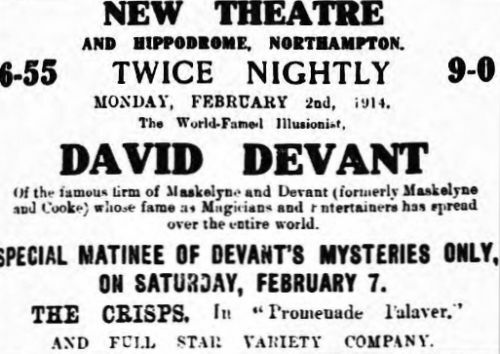 Right - An advertisement for the illusionist David Devant appearing at the New Theatre and Hippodrome, Northampton in February 1914 - From the Northampton Chronicle and Echo, 31 January 1914. 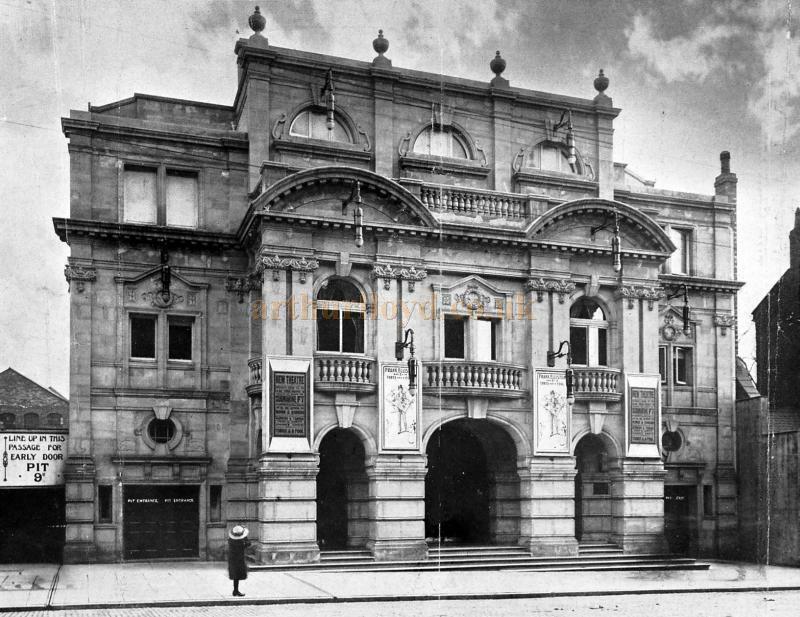 The Stage Newspaper reported on the opening of the Theatre in their 12th of December 1912 edition saying:- 'NEW MUSIC HALLS - THE NEW HIPPODROME, NORTHAMPTON. Under the patronage of the Mayoress, who occupied a box with Sir Henry and Lady Randall, and many members of the corporation and other notable personages, Northampton's new hall was officially opened on Monday. The house, which is built on the most modern principles, with all the latest improvements, fronts Abington Street, and is accessible from all parts by a good service of electric cars. Externally, the facade is of an imposing and handsome character, built in Portland stone, the architectural style being a free treatment of modern Renaissance which Mr. W. G. R. Sprague, the architect, has adopted with complete success. The entrance to the crush room, stalls, and dress circle occupies the central portion of the frontage, being divided from the entrance by massive bases of rusticated quoins surmounted by graceful pilasters supporting curved pediments. Above this rises an attic story, adding height and dignity to the frontage. Constructionally, a large amount of steel work has been used, many tons of which are contained in the girders of the gallery and dress circle. The house accommodates 2,300, and the furnishing and upholstery throughout are luxurious and comfortable. The scheme of decoration is a tasteful and delicate blending of green and gold, judiciously relieved by rose du Barri touches. The auditorium is arranged on the two-tier system, the dress circle and gallery being built on the steel cantilever principle, so that there is an uninterrupted view of the stage from all parts of the house. On the ground floor are arranged stalls and pit, while the boxes, circle, and promenade occupy the first tier, with a spacious gallery above. 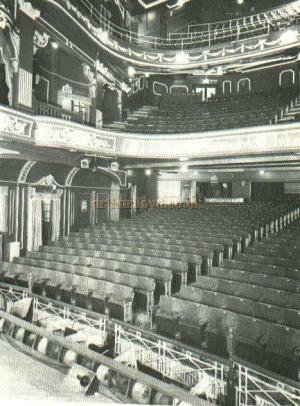 Left - The auditorium of the New Theatre, Northampton circa 1947 - From a period New Theatre publicity handout. - Courtesy Alan Chudley who writes: 'While still a Sam Newsome house, the New Theatre staff rewired the Theatre. This image is showing the then new Strand Electric "S" type footlights. The black lamp in the centre of the footlights is an Ultra- Violet lamp widely used in Revue and pantomimes. The dimensions of the stage are 70 ft. wide by 40 ft. deep, while the height to the grid is 24 ft. The whole of the dressing-rooms are conveniently situated and appointed. The handsome drop scene has been painted by Mr. Ernest Howard with his usual artistic taste and skill. The design takes the form of red curtains, charmingly draped. In the centre they are slightly opened by a Pierrette, who is enamoured by the singing of a love song by her Pierrot; behind the open curtain is revealed a blue sky and crescent moon. The whole conception of the design and its execution is pleasing to a degree, and was viewed on Monday with much admiration by Mr. Howard's many friends here and the audience at large. The theatre has been well guarded against fire both by fireproof material, a plentiful supply of hydrants and accessories, and a fireproof curtain. All the steps are of a very easy rise, and all protected by handrails; whilst the exits total up to fourteen - an ample safeguard against any emergency. The electric light is generated on the promises, two 60-h.p. gas engines being requisitioned for the installation, and over 800 electric lamps are fitted in the theatre. Six powerful arc lamps illuminate the entrance with brilliant effect. Heating and ventilation have been well studied, and are perfect. The directors are Mr. Walter. T. Simmons (managing director), Mr. H. S. Kingerlee, Mr Wilkins, and Alderman John Brown. Mr, W. T. Archer is the secretary, and Mr. F. H. Gallagher is the resident manager. Until the license has been arranged the theatre is to be run on the twice-nightly system. The public opening on Monday was most successful. There was no formal ceremony beyond the playing of the National Anthem by the fine orchestra under the baton of Mr. Albert Heyes, late of the Opera House here. When the curtain rose at the first house Alderman John Brown, one of the directors, was revealed, supported by Mr. Walter T. Simmons, Mr. H. S. Kingerlee, Mr. Wilkins, and Mr. Sprague. Alderman Brown, in a few introductory remarks, extended a hearty welcome to the audience to the splendid building that had been designed by Mr. Sprague. 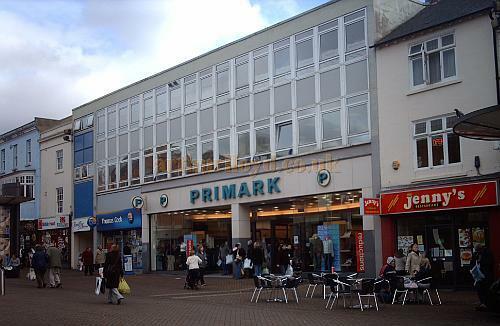 He hoped that it would give continued pleasure to thousands of people in Northampton. If they found anything to object to in the performances he hoped they would communicate at once with the directors. It was the directors' intention to make the show one that they could bring their wives, and sweethearts, and children to see, and ho hoped it would be well patronised. The above text in quotes was first published in the Stage Newspaper, 12th of December 1912. Above - The New Theatre, Northampton - From an early 1900s Postcard. In 1939 Reginald Foort who was the staff organist at the BBC brought his Mollor Organ to the New Theatre for a week and it was apparently so huge that it required five giant Pantechnicon trucks to deliver it and the Gallery Entrance of the Theatre had to be excavated by three feet in order to get the largest part of the organ into the building, part of which weighed two tons. The job took twenty men from noon on the Sunday until 5pm on the Monday to complete and was only just ready for the evening performance by Mr. Foort. The instrument was later to become the BBC Theatre organ after its original Compton was destroyed in the war. Later the Organ was moved to the Methodist Church in Hoxton. Left - A Bill for 'Strip! Strip! Hooray!' at the New Theatre in 1959, the last production at the Theatre before it closed - Courtesy Paul Bland. In its later years the New Theatre became a Number Two Variety house under Freddie Butterworth, but it did very poor business, and in its final years it staged mainly strip tease shows, thus earning the title of' 'The Newd Theatre.' The Theatre closed its doors for the last time after the last performance of 'Strip, Strip Hooray' in 1959. Its contents were then auctioned off before the building was demolished in 1960. 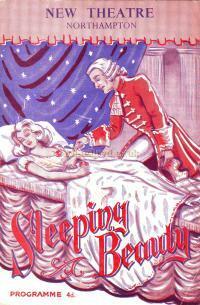 Left - A Programme for 'Sleeping Beauty' with Cyril Fletcher at the New Theatre, Northampton in December 1957 - Courtesy Susan Clarke. There is a nice film clip of Laurel and Hardy at the New Theatre, Northampton on the British Pathe site here. Above - The Demolition of the New Theatre, Northampton - From a photograph taken on the 28th of January 1960 by Mr. S. Day of the Northampton Camera Club - Courtesy Paul Bland. Above - The Site of the New Theatre, Northampton in 2008 - Courtesy Susan Clarke. Alan Chudley writes: 'The only time that I went to Northampton was in 1967 when the late Osborne Robinson, the Northampton repertory Company's resident designer was designing "Jack and the Beanstalk" for use at the Yvonne Arnaud Theatre in Guildford. The New theatre by that date was demolished having closed in 1959. 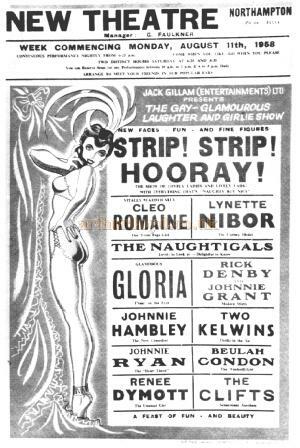 In my time The New theatre was leased to Sam Newsome of the Coventry Hippodrome, who made the lease over to FJB theatres in the early 1950s. - Alan Chudley. Above - A strip of tickets for the New Theatre, Northampton which were retrieved from the floor of the Theatre by Alan Ashton, former projectionist at the Savoy Cinema, Northampton in, in 1959 and during the auction of the New Theatre's assets before demolition. 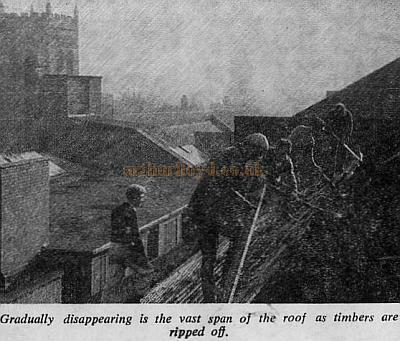 Below are some pictures of the demolition of the New Theatre which were published in the Northampton Chronicle & Echo in 1959 and were kindly sent in by Alan Ashton, former projectionist at the Savoy Cinema, Northampton. Gradually disappearing is the vast span of the roof as timbers ripped off. 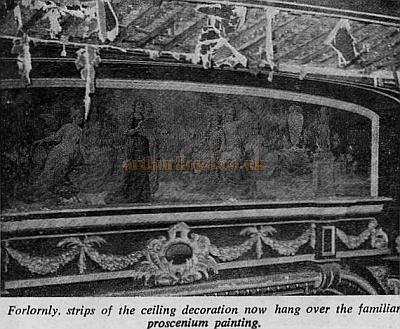 Forlornly, strips of the ceiling decoration now hang over the familiar proscenium painting. 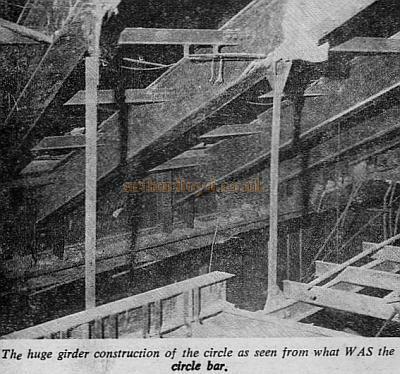 The huge girder construction of the circle as seen from what was the circle bar. The shambles at foot was front-row stalls. 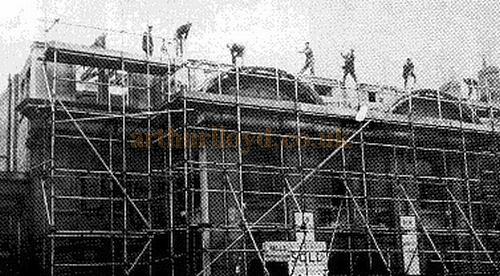 Above - Pictures of the demolition of the New Theatre which were published in the Northampton Chronicle & Echo in 1959 and were kindly sent in by Alan Ashton, former projectionist at the Savoy Cinema, Northampton. From the Northampton Chronicle & Echo of 1959 - Courtesy Alan Ashton. 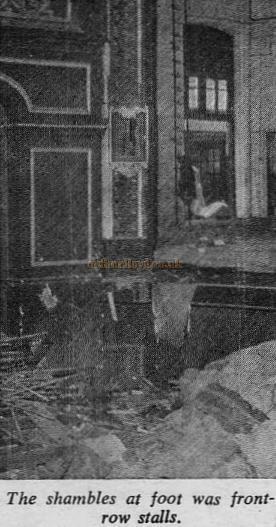 Above - Northampton variety star Bertha Willmott pays a final visit to the doomed theatre where she was so often top-of-the-bill - From the Northampton Chronicle & Echo of 1959 - Courtesy Alan Ashton, former projectionist at the Savoy Cinema, Northampton.